Michael Vickar and Jake Panavas both work in the finance industry. Everyday they dressed up in suits to go to work on Bay Street, that was, until they came up with the idea of creating their own clothing products. 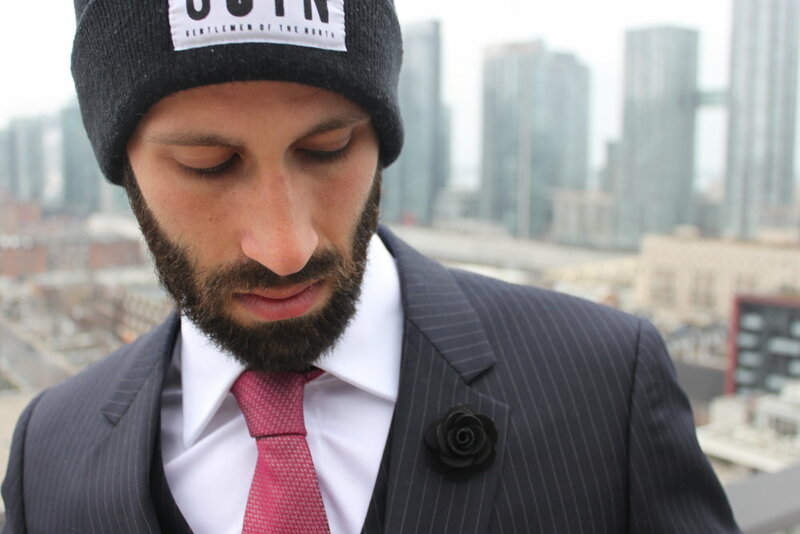 In 2015, they founded Gentlemen of the North, a Canadian clothing brand. It all started with accessories – socks and tie clips that they could incorporate into their daily outfits. After some time, their production line went on to include shirts, hoodies, toques, and earmuffs. The inspiration behind the Gentlemen of the North is to bring back in life the traditional idea of a gentleman, a well-mannered man with high standards of proper behaviour, and incorporate it into clothing pieces. “I remember this time period in books and movies when a guy gets off the car to open the doors for a lady. We are trying to bring back this gentleman back, but in the 21st century that includes both the street gentleman and a business gentleman,” said Vickar. Gentlemen of the North has three people working as a team as well as a graphic designer who helps in designing logos for their product. Each person from the team makes a different version of a product and brings it to the table. Then they all choose one that they like the most while trying to keep everything minimalistic as a brand. “We have different suppliers for each product. Essentially, what we do is for every single product we want what we do is we get samples from three different suppliers and then we pick the supplier we like best based on the time and quality. For, example, the person who makes our socks is different than the person who makes our hoodies. We want the best quality, we are willing to pay more for the best quality,” said Vickar. As a fairly new brand, Vickar and Panavas agree that starting a business with anybody else brings many advantages, but at the same time it is an obstacle when it comes to differences in their styles or ideas on how they want the brand to continue to develop. According to Vickar, the creativity part of the business is the most fun and enjoyable whether it is advertising or trying to find ways to give back to communities. Gentlemen of the North also partnered with Lay-Up Youth Basketball and committed to helping their mission to send underprivileged youths in Toronto to summer basketball camps. The company’s most important value is the customer service. “We always place the customer first, in every single purchase we write a handwritten note from us,” added Vickar. Vickar and Panavas plan to spread Gentlemen of the North across Canada. Right now they are in five retail locations in Toronto and they are thinking about spreading to other Canadian provinces. “We continue to drive on the brand, add more product line. We recently got samples of bathing suits and they are high quality, but we are going to see if we want to go in that direction. I know we are going to do baseball caps soon,” said Vickar.